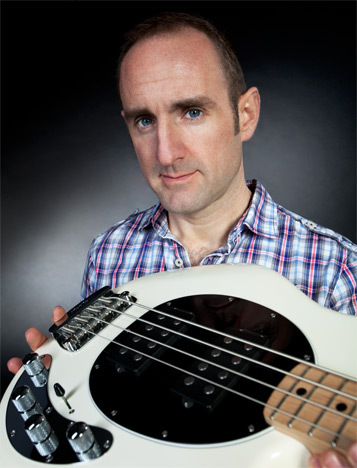 Rory Pearse is a specialist bass guitar tutor, composer and session clinician. His journey first started in 1986 when his brother gave him a guitar and from that day on he was hooked. Before long Rory was learning to play classic guitar riffs from legendary artists past and present, but it was the bass elements of the music that came naturally to his ear, so much so that Rory truly believes to this day that he was born with the natural gift of rhythm. Finding his own way, Rory was developing a real love for music in general and the key role that bass played, and was hearing the drum pulse in music so clearly that he now just wanted to lock it in with this new exciting bass sound. Thus in 1989 he turned his hand to the electric bass guitar and hasn’t looked back. Thirty years experience has led Rory to where he is today – a full time active bass guitar tutor, composer and versatile session clinician musician. Rory has had the absolute pleasure of playing live with some of the greatest guitarists in the world such as Dave Kilminster, Paul Gilbert, Greg Howe and more recently Chris Woods. Whether in a teaching, composing, or live playing environment, Rory continues to share his valuable knowledge, experience and enthusiasm with all he meets. Rory’s dedication to the music industry has led to him earning artist endorsements with major companies such as Ernie Ball Musicman Guitars, Genzler Amplification, D’Addario Strings and Accessories, Hercules Stands and Accessories, Awe-In-One Picks and Singular Sound Drum Machine Pedals to name a few. Born in Devon, Rory grew up on the historic Plymouth Barbican, and still lives in the vibrant waterside city of Plymouth with his wife, Tamsin. Rory is also the composer for Marett Creative, an Advertising Agency and Production Company based in the UK. So when Rory’s not teaching, he may well be writing their latest musical masterpiece for TV. Rory’s most recent composition has been for one of the West Country’s leading retail groups Trago Mills.